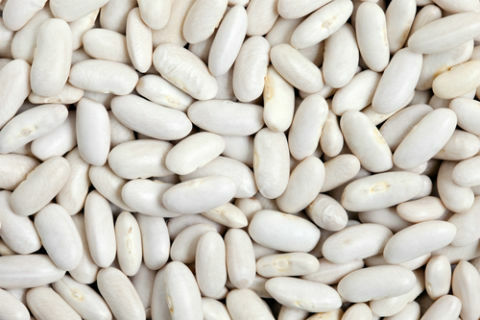 Do white kidney beans block carbs? I just read your Green Coffee Bean Extract and Raspberry Ketones: Myth and Reality article. I was wondering what your views/thought on white kidney bean extract to block carbs and starch? White kidney beans as a supplement are something I’ve never looked at closely before, so I was curious to see what I would find out. They’re probably effective at blocking alpha amylase, an enzyme that cleaves long carbohydrates into shorter ones. They work on starch, but not sugar or high fructose corn syrup. So they might help slowing the carb load from a pasta dinner but not your bottle of coke or sweets. I would tentatively recommend taking a supplement like this under the right circumstances. Let’s take a closer look at how this supplement works, where its usefulness begins and ends, and other options you have to get similar effects in your body. All of white kidney bean’s physiological activity boils down to its ability to block an enzyme called alpha-amylase from breaking down certain carbohydrates within your body. Starches are long chains of sugars that your body breaks down into smaller ones so it can use its individual units of sugar for energy. To accomlish this task it uses the enzymes amylase and alpha-glucosidase to accomplish this task. Amylase is present in your saliva, but most of its work is done in the intestine after its been secreted by your pancreas after a meal. The theory goes that since white kidney bean blocks amylase, carbs that would otherwise be digested rapidly are digested slowly or not-at-all. It sort of creates the effect of eating fiber since it turns digestable carbs into non-digestable carbs. After reading through various papers I’ve decided that this process happens as advertised. White kidney bean extract really does stop alpha-amylase from the pancreas and seems to do so in a manner that’s pretty robust to various physiological conditions. What’s less clear is how this one mechanism relates to the broader goals of blood sugar control, weight loss, and low-carb dieting more generally…..especially in the long run. Other enzymes can do the same work as amylase, just not as effectively. For example, maltase can also break down starch in your intestine, which is why kidney bean extract doesn’t work as well with people who already have a low carb lifestyle. The evidence becomes much more spotty when you look at how using kidney bean extract helps to combat broader health issues like weight loss and insulin resistance. Kidney bean extract works in a linear fashion, so the more of it you use the greater effect it has. There doesn’t seem to be a saturation point at which it stops working. There also doesn’t seem to be any reasonable dosages where it becomes dangerous. So in my opinion it’s fine to take up to 2 or 3,000 mg per day if you know you’ll be digesting a lot of starch. There’s no hard and fast rule about the best way to take it, but most studies measure the amylase blocking effect of kidney bean extract for four hours, and it seems to take its effect on the body within a half hour or so. (Again, these are broad statements not meant to be taken as gospel). Under most circumstances I reckon either taking it with a meal or 20-30 minutes before is a good idea. If you take it at the beginning of the day there’s a chance it might lose its effect by lunchtime. The best way to lower your carb load is to eat less carbs. No more sugar. Foods with a high phenolic content also block carb digesting enzymes. Cocoa, green and black tea, berries, and reservatrol suppress a variety of digestive enzymes that allow them to have a similar effect as L-Arabinose and kidney bean extract. They have the added benefit of acting on a wider variety of enzymes, making them a little more robust than either of these two supplements alone. Given its harmless nature and low price, I don’t see too much downside to experimenting with its use as long as you understand what it is and isn’t capable of doing. Thank you so much, how informative! I wonder how much work it would take you to develop your recommended stack. I am really appreciative of the time you took to answer this question, your knowledge and your ability to inform us in an “easy to understand” fashion is just wonderful. Thanks for your detailed review of white kidney bean extract. The white kidney bean extract mentioned on Dr. Oz, is Phase 2®, the first, and only, white kidney bean extract with any clinical studies behind it. After the exposure on Dr. Oz, numerous generic extracts were launched, particularly on the web, that are not as potent, or pure, nor do they have any studies showing they are safe or effective. A recent study comparing Phase 2 to a generic showed it took 150 mg of a generic extract to equal just 20 mg of Phase 2. Phase 2 is the only ingredient of its type that has two structure function claims for starch digestion and weight loss. It is marketed primarily as a weight control aid via dietary supplements. It has also been shown to aid in reducing the glycemic index of starchy foods. For more information readers can visit http://www.phase2info.com. you’re right that phase 2 is definitely the most well verified of all the kidney bean starch blockers, but I’d add that a general kidney extract has been shown to block carbs, so a well made white kidney bean extract should be effective in blocking the absorption of starch. Thanks for your reply. Question is, what is “well made?” From our standpoint it is a highly purified and potent white kidney bean extract with an amylase inhibiting level clinically shown to be effective, as well as one that has been shown to be safe. Phase 2® white kidney bean extract meets those criteria, as shown in the studies you cite. I’m not aware of any generic white kidney bean extract that meets that “well made,” criteria. If you are aware of studies on other white kidney bean extracts, I’d appreciate it if you’d pass them along. I’m referring to the fact that kidney bean extract that doesn’t have the phase 2 distinction has been shown to be effective in inhibiting amylase, and a supplement that’s made according to GMP standards will be tested for ingredient purity and stored in appropriate conditions, and thus should be considered appropriate. I do agree that phase 2 is the best studied carb blocker that’s out there by a long shot. hi. JB, that’s not always the case and rarely is. like pharmaceuticals, clinical and safety testing is of paramount importance to making sure a drug, supplement or even food is safe to consume, much less effective at delivering on claims. ingredients can look the same, but unless tested in the rigorous in vivo conditions in published studies cannot be deemed the same. I’m shocked to see that you are not aware of the very common side effect of white bean extract…extreme gas and bloating, as well as possible diarrhea. The gas has been reported as so problematic that people stop using it. Heidi, I’ve never heard of this side effect, sorry. I didn’t realize it was an issue for many people taking the supplement. On the other hand, I get constipated when taking a kidney bean extract on a cheat day and by cheat I mean I just eat say a higher carb count than usual and no sugar. I have been taking the white kidney bean extract for I think at least a year and a half if not more and it does help. I have had some loose stools in the past but not horrible. But now since I take 2 tumeric pills a day and ReAL greek yogurt with the live active cultures, I can certainly say I have 75% less gas now and no bloating. Awesome! Is there a particular brand you use? Thank you Sandra, it is always nice to hear others experiences. Do you take it regularly? Or just when eating high fat/carb foods? Thanks for the research here! I’m looking for something that will help get my fat burning going, as it seems even when I consume low carb my body doesn’t want to let go of the weight. I think I need something that will get the fatty acids moving out of the fat cells if you know what I mean (I’m not sure I know what I mean, lol). Exercise doesn’t do it alone, and I need help. I should say that I’m probably peri-menopausal at this point, so, I guess my biggest question here is will a kidney bean extract help at all or will I just be throwing my money away? On the sucrose (sugar) side, as much as L-Arabinose seems safer and more promising than say InSea2, that stuff is very difficult to find! It’s in minute quantities in the obscure “Phase 3” which itself is hard to find. Life Extension uses it in a couple of blends, and a multi-level marketing company called Ludaxx is basing its “F21” blend around it, though with odd additives. Thanks for this! To be honest I haven’t looked as closely as you at the different types of L-arabinose available. In light of your comment I’m inclined to check in with some suppliers to see what variants of the ingredient they carry, if any. I re-call they do, so I’m surprised it’s difficult to find a supplement with large amounts of it in their product. Hmmm……perhaps a new product idea someone can pounce on? Followup about the 100g containers of L-Arabinose branded “Sweetcrave” from “Nature Supplies” (actual company name “D-Mannose Ltd.”) via amazon.co.uk: I ended up ordering one on Friday May 30th after business hours and to my surprise, it crossed the Atlantic and got to my hands just 2 business days later on June 4th. So while a bit pricey, it seems to be legitimate. Thanks Stephane. Keep us posted. Sorry I couldn’t find a “reply” button below to your Phase 2 vs Phase 3 question. Phase 2 is white kidney bean extract which is essentially an inhibitor of our enzyme (alpha-)amylase which splits up starches (which themselves, are made up of various proportions of glucose and fructose for the most part). Undigested, startches stay in our intestines and feed our flora instead of ourselves, and are considered fiber. Phase 3 is L-Arabinose (often combined with chromium and what not, but the effect comes solely from L-Arabinose itself), which is a sucrase (a.k.a. alpha-glucosidase) inhibitor, preventing us from splitting sucrose into its fructose and glucose halves. It then too, feeds our flora. Both these inhibitors just inhibit a fixed, dose-dependent amount of our enzymes though, while we produce them at will, so I’d expect our bodies to adapt and compensate, so these inhibitors IMHO can be seen more as “slowing down” digestion than outright bypassing it. That’s why they’re marketed as reducing the glycemic index of meals but not so much for the total caloric content. Might also explain why people seem to need more of those inhibitors over time when using them chronically. Myself, I did experiment with InSea2, Phase 2 and L-Arabinose. They do seem to help with fasting blood glucose levels the next morning, but because I don’t see them as long-term solutions I don’t plan on relying on them outright. I just think they’re very useful “crutches” to have for lessening the impact of occasional crazy indulgences. White kidney bean extract (Phase 2 Carb Controller®) is most effective on fast-digesting carbs (potatoes, pasta, rice, bread), since it has been shown to inhibit alpha-amylase, the enzyme that digests starch (see http://www.phase2info.com for clinical studies). A natural glucose support complex, Phase 3 Sugar Controller®, (Also known as Prenulin®) combines the powerful glucose absorption properties of a specially-made, US-manufactured form of L-arabinose derived from corn, with the insulin control capability of Chromax, one of the most clinically studied forms of chromium. Studies show that 1 gram of Phase 3 reduces the glucose and insulin impact of 70 grams of sugar by almost 30% (see http://www.prenulininfo.com for study results). Phase 3 can be found in two products, Natural Glucose Absorption Control, and Optimized Irvingia with Phase 3 Calorie Control Complex, from Life Extension, http://www.lef.org. Thanks so much to you and Jonathan Bechtel for your expertise! L-Arabinose seems to be relatively important for blood sugar control but I don’t find it discussed anywhere else. As an afterthought, if you are using any of the carb blocker products Phase 2, 3) I don’t believe you should be taking any of the “digestive enzyme” products (as it seems to me they would basically cancel out the effects of the carb blockers). Good point. Never heard of phase 3, how is it different from phase 2? Carb-Ease Plus by Advocare appears to have the synergistic ingredients mentioned in this article. Good info! Never heard of L-arabinose, it sounds interesting. I’ve been experimenting with Natrol’s White Kidney Bean White Kidney Bean Intercept. I read (popular check out line magazine) it works best taking 6 capsules/day (2 per at each of your 3 main meals) vs the recommended 4/day. And, that the more carbs you eat the better it works. It apparently works the duration it takes the stomach to empty of food..roughly 2 hours? I think from my use this far (2 weeks off and on) all that info is correct. However, if trying to keep blood sugar down I cannot see consuming More carb-rich foods! Plus, it definitely doesn’t work on sugar/sweets. And, yes, it produces gas…a lot of gas. It’s possible it may produce a lot less, if any at all, if consumed with a large glass of water a good 20 minutes prior to a carb-rich meal. I say experiment with it to find out how it works best for you Before getting it for a foodie event (holidays). No fun having to scoot out of an event early because you’re full of gas! As a teen I used to follow the low fat, high carb mantra and I think this damaged my metabolism for good (cue big belly for life). Around 3 years ago I started to follow a moderate fat, high protein, low carb diet and this helped to stall my yearly weight gain. Recently I discovered white kidney bean extract and if I’m eating pasta, I take a capsule to reduce my carb absorption. Why am sold on this as a dietary aid ? In the past when exercising a lot, I rarely lost weight (1400-1600 calories a day). In fact due to my low protein diet, I probably lost muscle instead which in turn lowered my metabolism. I started taking in more protein in my diet 3 years ago but this alone didn’t result in weight loss. Recently I went on holiday and did a lot of walking, took white bean extract and upped my protein. I lost a small amount of weight and could see the loss on my face, arms and a small amount on the stomach. Taking the protein and doing weight bearing exercise ensured I wasn’t losing muscle. So is white kidney bean extract a viable weight loss product? It doesn’t really seem to help with weight loss that much because it doesn’t address your metabolism. I’m going to star having white kidney bean extract to loose weight. I had xenical for 8 months and that helped me to loose 12 kg but now doesn’t seem to work. My diet is rich on carbs, I know I should have more fruits and vegetables but I don’t like it! If I don’t have carbs and protein I won’t have food. Just hope this will help me. I work closely with Pharmachem Laboratories, developer of Phase 2 Carb Controller, the most studied white kidney bean extract. Per the comment by Matt, white kidney bean extract is not a stimulant, and thus doesn’t have an effect on increasing your metabolism. It acts to reduce the absorption of starch, and thus may aid in weight loss. One study showed that Phase 2 works best with people who tend to consume more carbohydrates. However, as with any weight loss regimen, you should follow a sensible diet and exercise program. You can learn more about Phase 2, and review numerous clinical studies at http://www.phase2info.com. Good Luck. I’m not familiar with C-120X. Sorry I couldn’t be of assistance. You should look into it: they’re your main competitor from what I understand. It’s from white kidney beans, like Phase 2, but a water-based extract. They claim that one of their tiny 2mg enteric tablets is functionally equivalent to 1500mg of the “leading white kidney bean carb blocker” which I assume is Phase 2. Really appreciate the additional information you provided. I used to take natrol’s carb intercepter(white kidney bean extract) and always wondered whether it has effect or not. This article was really helpful thank you. I think it is useful for cheat days as you said. I didn’t gain any weight after cheat days with carb intercepter. Recently, there are many diet supplements used HCA(garcinia) that seems similar with white kidney bean extract. I wonder that there is any difference between two supplements and which one is better for carb-blocking. I’ve been taking 2 – 4 capsules on my cheat days and – as long as I move a little that day and stop eating once I’m full – I have not been gaining any wait next day. I have a low proton in my urine. Is it good to take for me?